Years ago, a friend came home with a new, top-of-the-line road bike. My first thought: How can he afford that? It seemed like such a big purchase based on what I thought I knew. We lived in the same neighborhood, were close to the same age and both had young families. His life looked a lot like mine — at least I thought it did. It was only later I learned he’d paid for the bike using a small portion of the annual interest he’d earned on his investments. In other words, he could afford it. At the time, I had no way of knowing that the image I had had of my friend wasn’t reality. 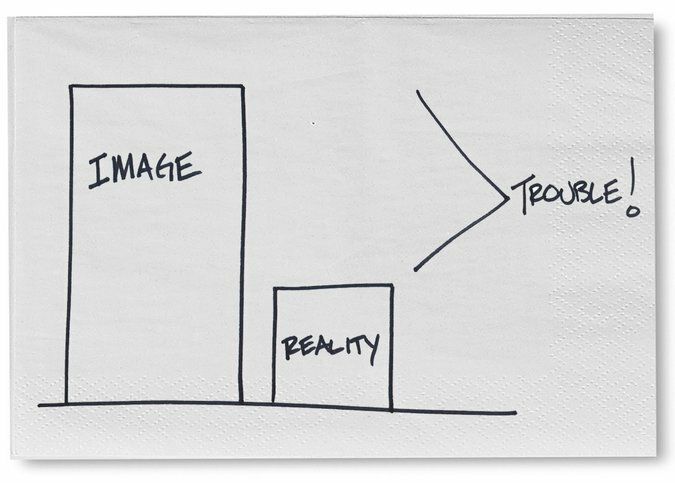 It turns out we can get into trouble when we assume the image is the reality. A recent conversation with another friend reinforced this point. We were discussing the incredibly sad story of L’Wren Scott and how, on the surface, she appeared to be living the fairy-tale life of a glamorous fashion designer. It was only after her death that her financial struggles were revealed, and even close friends were shocked to learn how bad things had gotten. My friend lives and works in Jackson Hole, Wyo., home to some incredibly wealthy people. He shared the story of an acquaintance who bought a gorgeous, multimillion-dollar house on a stunning piece of property. From the outside, it appeared these people were living the dream. The reality? They borrowed 100 percent of the money to buy the home, and the payment on the mortgage put them right on the edge of what they could afford. It left no room for error — financially or emotionally. Of course, it only takes one thing going wrong for a borrowed dream to become a nightmare. Unfortunately, one thing did go wrong; left with no options, the dream had to be sold. Sometimes things are much better than they appear. The investor Warren Buffett continues to live in the same house he bought in 1958. Clearly, he could afford to buy a new home at any point during the last 50-plus years, but he hasn’t. If we based our judgment of Mr. Buffett’s wealth on his lifestyle, it wouldn’t be a particularly good indicator of the reality. The truth is we don’t know what’s going on in other people’s lives. Unless we start walking around with our net worth flashing above our heads, we only have assumptions. The problem is those assumptions are just as likely to be wrong as right. But the truth is we need to stop making financial decisions based on assumptions we make about other people’s money or an image we prefer that’s different from our reality. Because we live in a hyperconnected and competitive world, it’s not easy to do. It’s far easier to get caught up in someone else’s highly curated Instagram feed than it is to stay in tune with our own reality. But trying to keep up with the image we have of others is super dangerous. So if you find yourself justifying important financial decisions based on what you think you know about other people, now is a good time to stop. As we continue to learn, this is serious business. Don’t let the images confuse you. There’s a reason we call it personal finance, because it’s all about you. Your personal finance is not your neighbor’s, your brother-in-law’s, or that person’s on TV. It’s your money, and what you do with it is your decision. And the only reality that matters is your balance sheet — not the image of a new bike sitting in the neighbor’s driveway. 0 responses on "Featured Blog: React to the Reality, Not the Image of It"